Gluten free coarsely ground wholegrain oats* 76,5%, apple cubes* 8%, sultanas* (sultanas* 99,5%, sunflower oil*), chopped and roasted almonds*, apple flakes* 3% (apple purée 40%*, rice flour*, apple juice concentrate* 20%), blueberry powder* 3%. May contain traces of sesame seeds, soybeans and other nuts. This is a natural product and in rare cases may therefore contain small stones, peel residues and seed residues despite meticulous processing. Filling level determined by technical process. 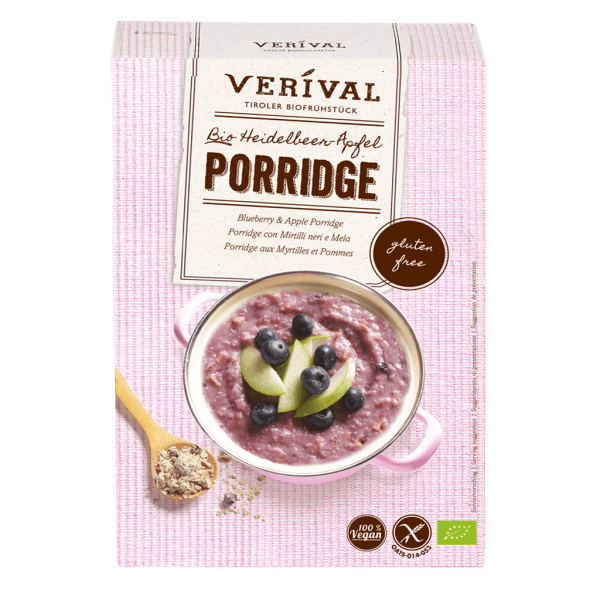 Put 50 g porridge (6 tbsp) in a bowl and pour over 140 ml boiling water or 110 ml hot milk (depending on the consistency desired). Stir, leave to soak for 3 minutes and enjoy warm. “Overnight oats“: Add a bit more cold water or cold milk and leave to soak overnight.